Our gaming experts all agree on one thing - 2016 is going to be one hell of a year to be a gamer. But which platform is going to have the best year? We've given our PlayStation, Xbox, Nintendo and PC gaming experts a chance to make their case and explain why their device is going to be the dominant games machine of 2016. Today we're continuing with what it means to be an Nintendo gamer in 2016. When it comes to video games, 2016 could very easily be the year of Nintendo. The Big N is traditionally pretty secretive about what it has in store, but what we know already points to an incredible year: some blockbuster titles from major franchises, celebrations of big anniversaries, a variety of software for all types of gamers, and the reveal - maybe even the release - of new hardware. Admittedly, 2015 had some disappointments for us Nintendo fans. Some of the most anticipated releases were delayed, and outside of Super Mario Maker, Splatoon, The Legend of Zelda: Majora's Mask 3D, and a handful of others, there were no marquee titles for the Nintendo faithful to hang their hats on. But 2015's loss is 2016's gain: the still-untitled Legend of Zelda for Wii U is scheduled to arrive late this year. We don't know much about it aside from the promise of a vast, open world and Link's ability to slow-mo jump off his horse while executing archery acrobatics, but it's still unquestionably one of the year's most eagerly awaited games. The fervor surrounding Link's latest is sure to only increase as Nintendo reveals the dungeons, items, environments, and play mechanics contained within this epic fantasy adventure. That's just part of what's in store for Zelda fans. The Legend of Zelda: Twilight Princess HD for Wii U revives one of the series's most gripping 3D entries with enhanced visuals, amiibo functionality (there's even an amiibo bundle), and other improvements when it arrives on March 4. The combat-focused spinoff Hyrule Warriors Legends hits the 3DS on March 25, featuring a variety of playable characters and more content than its Wii U predecessor. Of course, 2016 also marks the 30th anniversary of the Zelda series's original release in Japan, so there could very easily be even more Zelda goodness on the way. Zelda isn't the only big series celebrating a milestone anniversary in 2016. Nintendo and the Pokémon Company have dubbed February 27 Pokémon Day, which marks the 20th anniversary of the series's debut in Japan. Under normal circumstances, the return of two-decade-old games might not be terribly exciting, but Pokémon Red, Blue, and Yellow aren't normal games - these are legendary, generation-defining titles getting updated with wireless features for their arrival on 3DS Virtual Console. Additionally, fans will be able to get their hands on Pokémon-themed special-editions of the Nintendo 2DS system (in Europe) and the New Nintendo 3DS (in North America). If you're a Pokéfan who hasn't got onboard with the recent 3DS hardware, these bundles offer the perfect opportunity. And for a different kind of Pokémon experience, there's Pokkén Tournament, the Pokémon one-on-one fighting game that hits Wii U on March 18. As popular as Pokémon is, it's far from the only big series fans have to look forward to in 2016. Star Fox Zero, the other major title delayed from last year, will hit Wii U on April 22. Fox McCloud and his anthropomorphic animal allies have been out of the spotlight for a while, but Star Fox Zero - essentially a retelling of the original SNES classic - might just be the game to bring them back to prominence. At the very least, the game's reliance on the GamePad to provide an alternate view of the action is sure to deliver a shooter experience unlike any other. Over on 3DS, strategy fans will be treated to the next installment of the Fire Emblem series, Fire Emblem Fates, on February 19. The previous entry, Fire Emblem Awakening, took the series from niche status to bona fide hit, and Fates looks to deliver even more of the fantasy, action, drama, and tactical combat that worked so well before. 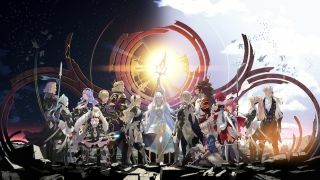 And with two distinct versions of the game - Birthright and Conquest - as well as a downloadable third version and extra DLC, Fire Emblem Fates is practically guaranteed to be among the most content-rich games of the year on any system. Those titles are only a fraction of what will be available on Nintendo systems in 2016. Games like Mario & Sonic at the 2016 Rio Olympic Games, Bravely Second End Layer, Dragon Quest VII and VIII, and the Fire Emblem/Shin Megami Tensei crossover RPG also promise hours of fun. And despite Nintendo systems' reputation for poor third-party support, there are quite a few promising games on the way, ranging from Final Fantasy Explorers and Mega Man Legacy Collection to Shantae: Half-Genie Hero and Return to Popolocrois: A Story of Seasons Fairytale. However, the most exciting Nintendo event in 2016 - or, arguably, the most exciting gaming event in 2016 - is sure to be the unveiling of the NX hardware. Announced nearly a year ago, the NX has remained a huge mystery, but Nintendo has promised that the system's coming-out party will be sometime this year. E3 in June is the most obvious time for the debut, but Nintendo has been known to sneak hardware news out early so E3 can focus on the games. As to what the NX is going to be, guesses are all over the place, from a handheld/console hybrid with a curved LCD screen on the controller and "cutting-edge chips" to a budget-priced system that's scarcely more powerful than current machines, and release date estimates ranging from this summer to sometime in 2017. Nintendo execs have gone on record saying that NX will be a completely new experience when compared to Wii U and 3DS, but no matter what it is, it will surely be turning a lot of heads when it's finally shown - and it almost certainly won't require you to strap a pair of $600 goggles to your face. Game-wise, it's very likely the NX could launch with a new 3D Super Mario game, along with the latest project from Metroid Prime developer Retro Studios, and perhaps an NX-enhanced port of The Zelda of Zelda for Wii U. But the most captivating games could easily be the ones we can't even imagine yet - groundbreaking titles and new concepts that take advantage of the NX's new features in creative new ways. Without a doubt, hundreds of developers are already hard at work on a software library designed to surprise and delight gamers the world over. At the very least, what we already know about Nintendo's plans points to a steady supply of quality games, and learning about what we don't know should be one of the biggest gaming stories of the year. Either way you look at it, the company is going to continue doing what it does best - delivering top-notch family-friendly fun - and chances are good that 2016 will be a fantastic time to be a Nintendo fan. We need Nintendo - don't let the magic die.